The international postal system governing the shipment of small packages (4.4 pounds or less) is causing significant financial losses for many countries, distorting markets, and it must be fixed quickly. 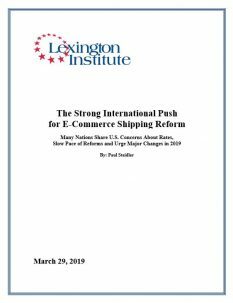 Postal officials in seven industrialized countries have offered these and other timely observations to the Lexington Institute over the past 10 days. At issue is the future of the Universal Postal Union (UPU), the United Nations specialty organization that sets rates and regulations for international mail and packages, through a process known as terminal dues. The current system enables small packages to be sent from China to the United States and other countries at a fraction of the price that it costs to send the same size package domestically. The Trump Administration has served notice it will leave the UPU on October 17, 2019 unless reforms are made in accordance with an August 23, 2018 Presidential Memorandum. Important steps have also been taken by the Administration and the Postal Regulatory Commission to self-declare postal rates for international shippers by a January 1, 2020 deadline. Long before the Administration’s actions, however, many countries had deep frustrations with the UPU for the same reasons the Administration identified. The UPU system subsidizes shipments from a handful of large exporters of e-commerce, most notably China, while forcing other countries to pick up these costs. The internationally subsidized postal rates also give Chinese merchants and manufacturers a competitive advantage over those in other countries. Previous attempts by the UPU to fix this problem have simply not worked and there is a strong desire to see significant and lasting change in 2019. The threatened U.S. withdrawal is focusing unprecedented attention on these matters, with 2019 the apparent make or break year for significant UPU reforms. As such, the findings from this survey are timely for several reasons. On April 9 the UPU’s Council of Administration will begin an important meeting to decide what reforms to recommend and how the 192-member body will evaluate them. There are two primary options for the latter, a special convention or ballot voting. Each country has one vote. We hope that the transparency the seven countries have shown by providing direct, clear and in-depth responses will be emulated throughout future UPU meetings, which have significant importance for worldwide e-commerce. As such, the UPU findings and proposals should be readily accessible in the public domain. Over the years many have expressed frustration with the UPU’s lack of transparency. It will also be important to know the justification that China is using to keep itself designated as a developing country and therefore entitled to generous shipping subsidies. This bizarre classification for the world’s second largest economy has disadvantaged many businesses in the United States and throughout the world. Finally, given the potential of a U.S. withdrawal from the UPU and potential new agreements with countries individually or collectively, it will be important to have expanded, public dialogue about the concerns and needs of all UPU member countries. This entry was posted in Logistics, Studies. Bookmark the permalink.